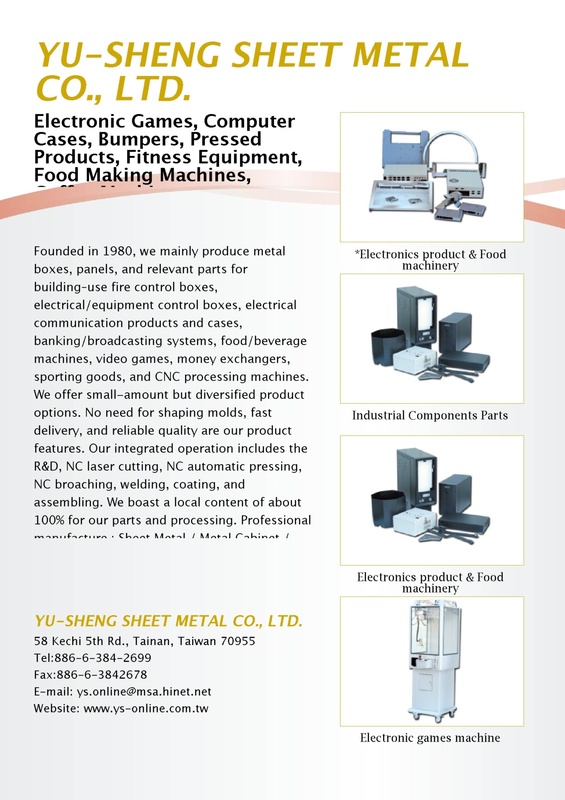 Founded in 1980, we mainly produce metal boxes, panels, and relevant parts for building–use fire control boxes, electrical/equipment control boxes, electrical communication products and cases, banking/broadcasting systems, food/beverage machines, video games, money exchangers, sporting goods, and CNC processing machines. We offer small-amount but diversified product options. No need for shaping molds, fast delivery, and reliable quality are our product features. Our integrated operation includes the R&D, NC laser cutting, NC automatic pressing, NC broaching, welding, coating, and assembling. We boast a local content of about 100% for our parts and processing.